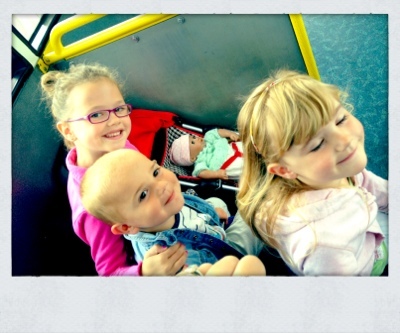 Mummy, Wife and Chaos: A bus trip with children! Who said a bus trip had to be a stressful occasion? Having more time at home with mu babies means I can no longer use the "another day" darling excuse. Particularly so as the bus stop is just outside our house! For £3.50 return I took the little darlings on the bus to town, I even let the eldest take her baby complete with 3 changing bags and pram! Talk about a chilled out mama! What's more it killed a few hours, it meant I got around the shops in calm with the promise that we would get the bus home (bless-still young enough to realise there was no other way home) and we even bought eggs to make cakes this afternoon. Lesson learnt today- being a calm happy mummy works. The kids loved such a simple treat!